So I'm really late to the party. Back when I first started blogging - almost 2 years ago - Anthropologie started selling a pom pom wreath. 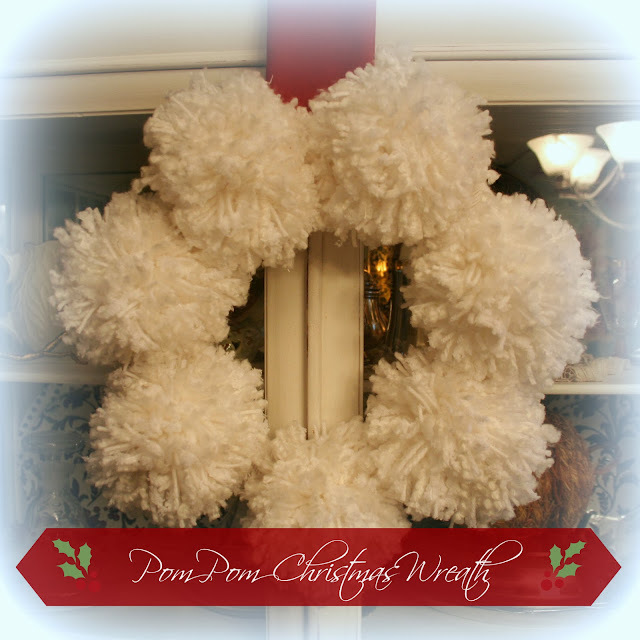 So wonderful that people were making "Anthro Inspired Pom Pom Wreaths" all over blogland. My friend Linda made one. Hers has a bow on it. I love the yarn she used. But I didn't make one then. I was busy making pine cone Christmas trees. But I never forgot about those pom pom wreaths. I rather pined for one. 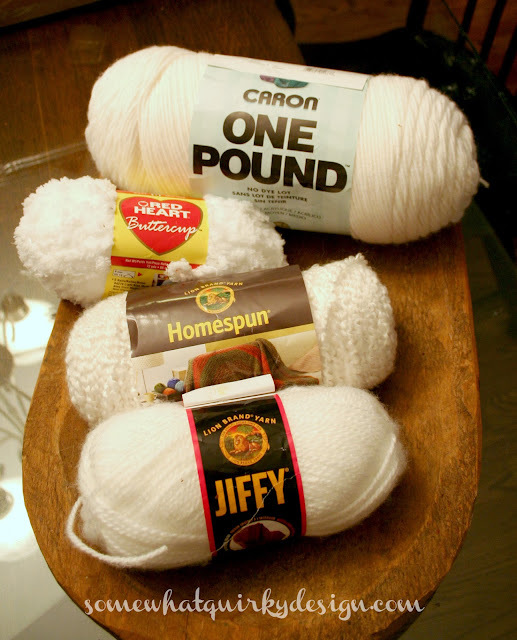 So I bought some yarn. And I combined them and rolled them all up into one big ball. And made some pom poms. I told Mr. Quirky I was making pom poms. He said POM POMS??? Like cheerleaders use. I said "NO SILLY!" 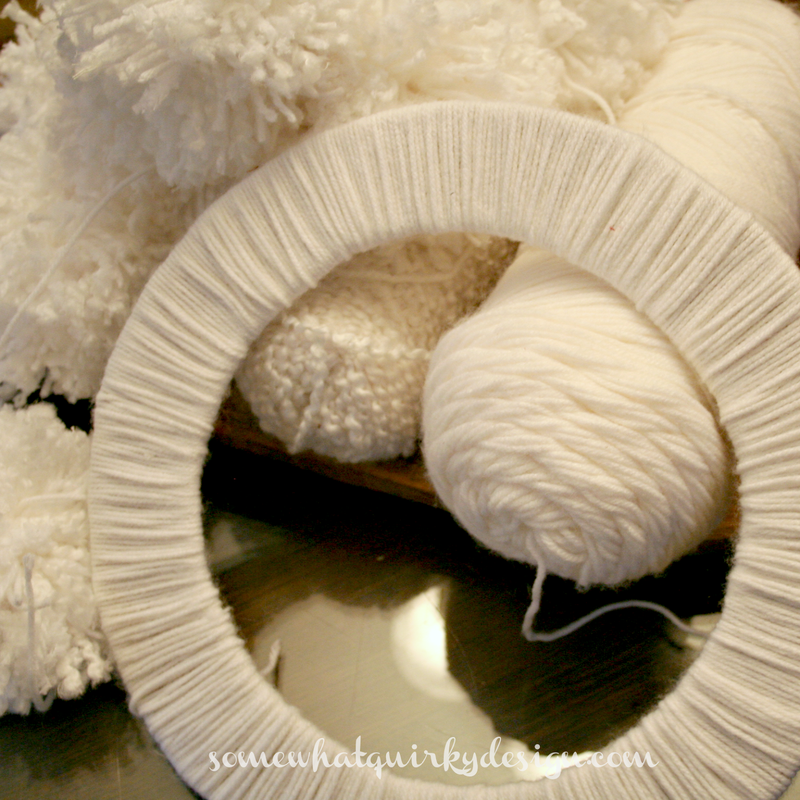 I'm making wreath pom poms. I think he thinks I'm crazy. Then I cut a circle out of cardboard and wrapped it in yarn. Then I tied them to the cardboard ring that I covered with yarn. My pom poms were a little uneven. I mean I can't even make an even pom pom. Trimming them made a very big mess. I love my pom pom wreath. I want to sleep on it. Now I'm part of the crowd. 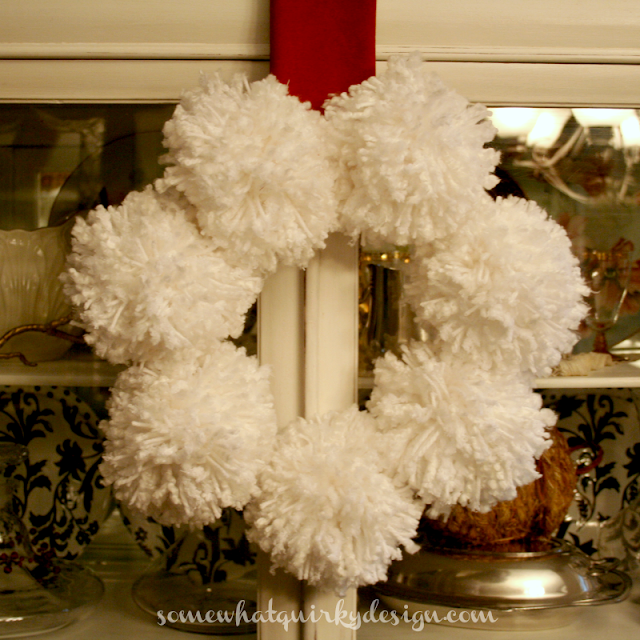 The "have you made your Anthro inspired pom pom wreath?" club. I'm sweeping up pom pom fuzz. P.S. 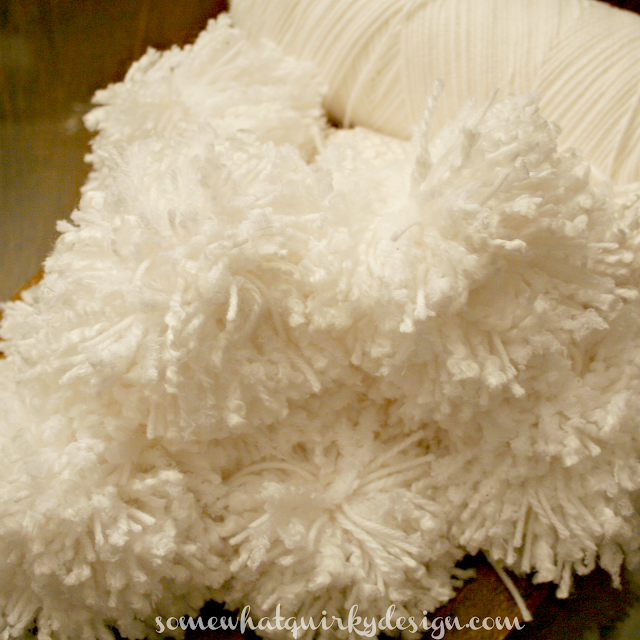 you can learn how to make pom poms here. You know, I really like those wreaths, but I have an unnatural aversion to making pompoms, which may have something to do with the fact that I was captain of the cheerleading squad in high school and had to make 40 of them for our saddle shoes. The only pom poms I've made have been for my sock monkeys arms and legs. 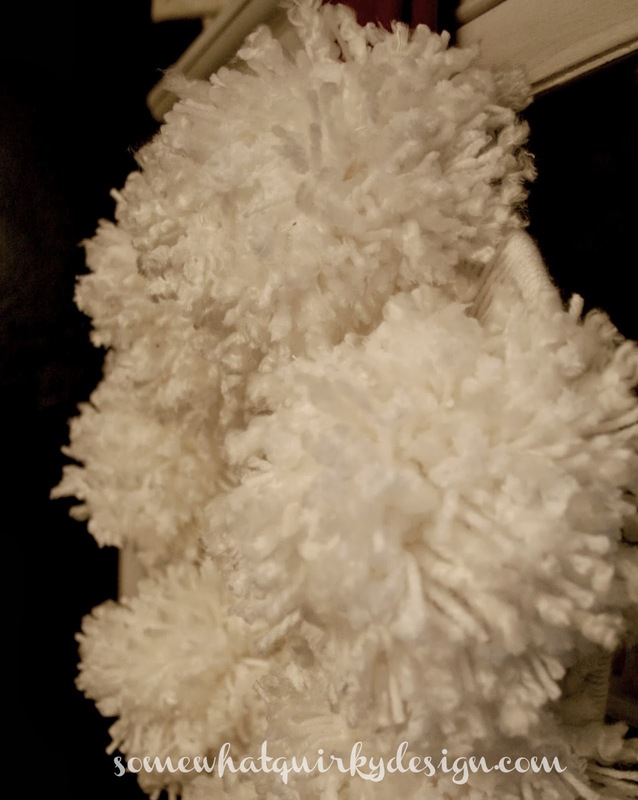 Your big fluffy pom poms bring back memories of making them for my ice skates in my youth. Fun wreath! I like your wreath! It looks like big, fluffy snowballs. 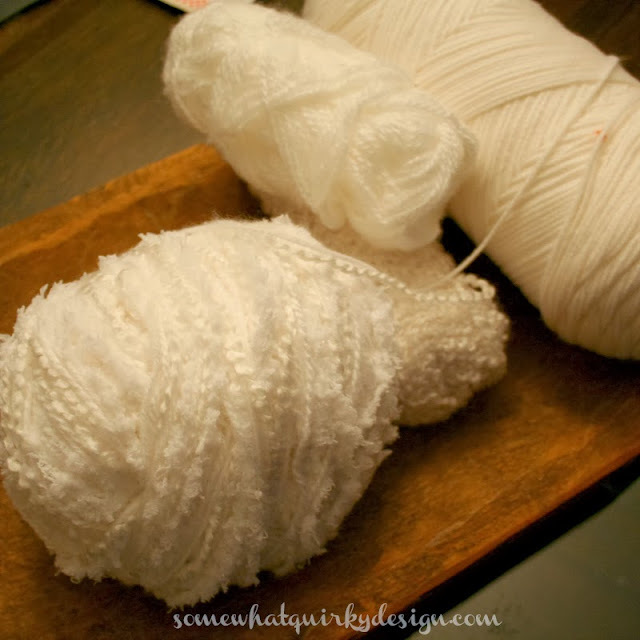 Good idea to combine different kind of yarn. I have never made a pom pom of any kind. Yours is lovely. I must be totally out of the loop because this is the first pom pom wreath I have seen, but I love it and it really looks super soft and cudly. I'm visiting from the Clever Chicks Blog Hop. This is super-cute! I bet my kids would enjoy making this with me! I love your soft and fluffy pom wreath. And thanks so much for linking up, my friend!!! Clever idea and fun that it's not the normal thing! Like you I've always wanted to make one of these. Unlike you I haven't gotten around to it yet! I love yours. Pinning! it's really cute!! And you can keep it up all winter! Very Pretty! You are still ahead of me, I have not made one yet! Happy Thanksgiving!